Attention all pet owners! 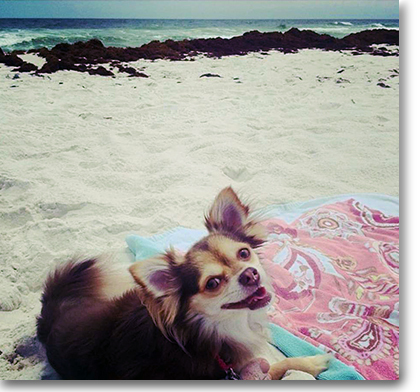 You don't have to leave your fur baby behind while vacationing on the Gulf Coast. The area offers a great selection of condos and homes that allow you to spend your beach getaway with your four-legged friend. The Gulf Coast has become more dog friendly over the recent years with a significant increase in pet-approved accommodations and community dog parks. Cities such as Gulf Shores, Perdido Key, and Pensacola Beach even have designated beaches for your pup to enjoy the sandy white beaches and beautiful waters of the Gulf of Mexico just like their owners! Most rental agencies will charge a non-refundable pet fee ranging from $100-$200 to cover incidentals. Be sure to check for size restrictions as some companies have maximum weight limits (25 pounds or less). Read on to learn more about dog-friendly lodging, parks, and attractions along the beaches of Alabama and Florida Panhandle. *Most condo associations on the Alabama Coast and Florida Panhandle allow owners to have pets. The condos mentioned below are known for pet-friendly units. If you are planning a vacation, please contact your rental company regarding their pet policy. Gulf Shores condos that offer pet-friendly units include The Dunes and Navy Cove in Fort Morgan and is just minutes from a popular dog beach. Closer to the heart of Gulf Shores in the West Beach area is Sea Oats condominiums. This family-oriented complex provides several units that allow small dogs. If you are looking for larger accommodations, many home rentals in Fort Morgan and West Beach offer pet-friendly accommodations with plenty of yard space for them to run around. The only dog-friendly beach in Gulf Shores is located at the western tip of the Fort Morgan peninsula and Fort Morgan State Historic Site. The beach runs along the Mobile Bay (north) side between the old Fort Morgan Pier and Old Fisherman's Wharf. Beyond this area is a federal wildlife reserve and is off-limits for pets. The park charges a small entry fee and is open from 8:00AM to 5:00PM every day. Gulf State Park is another great place for your pets to stretch their legs along the many nature trails and freshwater lakes. The Hugh S. Branyon Backcountry Trail consists of 15 miles meandering throughout the 6,500-acre park and spans from Gulf Shores to Orange Beach. Does your puppy love to swim? Play fetch all day long at The Dog Pond at Lake Shelby, the only spot in Gulf State Park where dogs can roam free sans leash. If you plan on staying for a few days, the park offers several dog-friendly cabins and cottages located around the lake. City of Gulf Shores Dog Park is located at 308 Clubhouse Drive less than a half-mile from Hwy 59. The parks features a large green space with fenced-in sections for small and large dogs. Pine trees provide plenty of shade and amenities include picnic tables, waste stations, and water for pets. At Gulf Shores main public beach, the newly revamped Gulf Place is a great spot for daily walks with your pooch on the promenade that runs along the beach. Stroll over to a number of nearby restaurants like Bill's By the Beach or Ribs & Reds to enjoy great food and laid-back atmosphere out on the deck. Other dog-friendly dining spots include The Royal Oyster, Beach House Kitchen & Cocktails, and Flying Harpoon. Silver Beach is the only dog-friendly beachfront condominium that allows both owners and renters to have pets. Silver Beach is a popular family-friendly complex conveniently located in the heart of Orange Beach close to several shopping centers and restaurants. These 2- and 3-bedroom condos feature large gulf front balconies with tempered glass railings. In addition to being pet-friendly, Silver Beach offers a large gulf front pool, outside BBQ area, and onsite parking. Orange Beach Villas is another pet-friendly property located off Canal Road just 5 minutes from The Wharf. If you are looking for a short-term stay, check out Orange Beach's newest boutique hotel, Hotel Indigo. This beachside hotel allows a maximum of two dogs weighing up to 40 pounds for an additional $75 per room. Located next to Gulf State Park, Hotel Indigo sits directly across the street from the Gulf and offers a complimentary beach shuttle, fitness center, conference room, and a locally-owned coffee shop. Orange Beach Waterfront Park is a great spot to walk your pet with great scenic views of Wolf Bay. The park is located on Canal Road approximately 1/4 mile east of Hwy 161 and is open to the public all year long. Visitors can enjoy many of the park's amenities including a 400' fishing pier, kid's playground, well-lit paved walkways, and covered pavilions with picnic tables & grills. Located off Canal Rd just east of Hwy 161 is Unleashed Dog Park. This community-funded park is another great place for your pup to enjoy the outdoors from sunrise to sunset. The park offers fenced-in areas to separate big and small dogs, water stations, training stations, waste collection bags and disposal sites. Dog-Friendly restaurants in Orange Beach include Pirate's Cove, Cosmo's Restaurant, Luna's, The Gulf, and Villaggio at the Wharf. Treat your tastebuds to a delicious seafood dinner alongside your furry pal on the outside decks or patios of these great dining establishments. Depending on the rental agency you use, there are a number of properties that allow small dogs including gulf front condos at Beach Colony Resort and Beach & Yacht Club. A handful of Perdido Key home rentals along the Gulf of Mexico, Old River, and Perdido Bay allow guests to have pets. Perdido Key FL offers a dog-friendly waterfront park located at 14484 River Road Park adjacent to La Serena condominium. The park has direct access to Old River and features a stretch of sandy beach, a gazebo, and small kid's playground. Here you can walk your pups along the shoreline. Leashes are required for pets between May 1st through September 30th. Sunset Grille, Flora-Bama Yacht Club and Ole River Grill are dog-friendly dining spots offering wonderful Gulf Coast seafood with casual outdoor seating. Many boaters pull up on the beaches in front of these restaurants for a bite to eat after spending the day fishing in the Gulf or cruising around Terry Cove and Robinson Island.